If you’ve been keeping up with this blog for a while you’ll no doubt know that hot drinks aren’t usually my favorite thing. However, call it getting old or a change of heart or whatever you like, this week I was drawn to feature a hot drink. It’s one that’s almost universally known, but I wonder how many people have actually tried one. I know I haven’t. But, let’s mix us up some Hot Toddies and see if we can’t change that. Regan mentions that there is nearly endless possibilities for variation with this cocktail and it’s easy to see why. I’m looking forward to digging my heals in and hopefully changing my viewpoint on hot drinks forever after. Any great Toddy recipes you’d care to share? Imagine a perfect day in Scotland. The mist is clearing off the rolling green hills, the sun is breaking through the clouds, it’s going to be a fantastic day. You spend the day fishing, or shopping, or golfing, or whatever floats your boat. Come middle of the afternoon it’s warm and you’re ready for a refreshing cocktail to start your evening off right. Would said cocktail include Scotch, ginger beer and lime? No? Well, might I suggest that it should. The reason I say this is easy, the Mamie Taylor, which I’ve taken my sweet time testing, is refreshing and delicious. But, it’s more than that. It’s a combination of flavors that I wouldn’t have ever thought would go well together. However, in this mix, they’re really harmonious and play off each other very well. Let’s start our discussion with the spirit in this cocktail. Scotch is an interesting beast when it comes time to mix up a cocktail. There are so many options, each with it’s own nuances and particularities, which is why it makes sense to reach for a blend in most cocktail cases. With a blend you’re going to get, obviously, a blend of the flavors that make up the range of Scotch offerings. For me I reached for Johnnie Walker Black Label. It had the character I was looking for and the flavor worked really well in this drink. I tried Famous Grouse as well, but wasn’t as impressed. There was something nagging on my mind though as I sipped my Mamie Taylor with Black Label. I wished it had just a touch of smoke. Simple enough I thought, I’ll make my next one with Ardmore and that should fix the problem. Not so. The resulting cocktail wasn’t undrinkable, but I jotted down in my notes one word that sums it up nicely. The drink was “funky.” Back to the drawing board and finally it came to me. I pulled down my bottle of Laphroaig Cask Strength and added 1/4 oz to the mix, making up the rest of the 2 oz with Black Label. It was one of those light bulb moments. The subtle smoke I was hoping for was there, but not overpowering or off-putting. Now I moved on to the ginger beer. I tried a few different options and found that they are all pretty tasty. This week I’ve primarily been using Gosling’s ginger beer and found that it’s strong ginger punch was the other key to this drink. I’d say you can definitely go with either a ginger ale or ginger beer, but make certain that it’s got a good ginger component. Regular soft-drink style ginger ale isn’t the right choice here. It’ll be smothered by the Scotch. As for lime juice I have two comments. One, and I hope I don’t have to tell you this, use fresh. Two, I bumped it up to 1 oz to add more sourness. If you’ve made your own ginger beer from the recipe I tried then this won’t be necessary as you’ll have a bit more sourness going in. Last but not least, I was just reading an article about bitters in a recent issue of Imbibe Magazine. It was penned by cocktail master Paul Clarke and he mentioned something I would never have thought of (seems I need to do some more thinking about cocktails). Per Paul, orange bitters work really well with the flavors of Scotch. So, wanting to test that theory, I tossed a couple dashes in my last Mamie Taylor (the one I’m sipping right now, in fact). And, I can tell you Mr. Clarke is absolutely right. The flavor of the bitters plays extremely well with the scotch, ginger and lime and the bitterness further rounds out the balance of the cocktail. Definitely a worthy addition. With that I’ll come to an end. Sadly, I’m guessing that, like me, it’s not summer in Scotland for you. But there’s good news. 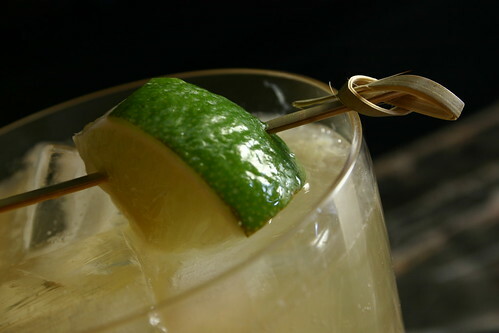 You can still mix up a Mamie Taylor and enjoy a refreshing, delicious cocktail. Cold, fall weather be damned. Enjoy, my friends. It’s been radio silence here for the last few days. Sorry about that. Things have been busy. I haven’t been completely lazing around, though. While looking through some of my old books for more recipes I stumbled upon the Mamay Taylor. Which, interestingly, in this spelling isn’t mentioned much on the internet at all. In fact, I was only able to find one reference in a 1904 book on the EUVS (Exposition Universelle des Vins et Spiritueux) site. Frank Newman’s American Bar gives the recipe for the cocktail, albeit in French, that matches the one I found in my reprint of Harry McElhone’s 1927 book Barflies and Cocktails. The recipe is much different from the one I’ve been focusing on the last couple weeks. I’ve got to think it’s also named for Mamie Taylor. And, since the Mamie Taylor originated in 1899, it seems logical that this drink could be a spin off of the original. The drink itself is quite tasty. However, as listed it lacks a sourness to balance out the sweet of the ginger ale. I fixed that with about 1/3 oz of lemon juice. The lemon slices are still nice in there though. They add some natural bitterness and the oils in the skin add additional lemon flavor. I’ll be filling you in on my thoughts on the Mamie Taylor. Until then, try a Mamay Taylor. It’s a good twist on this classic. 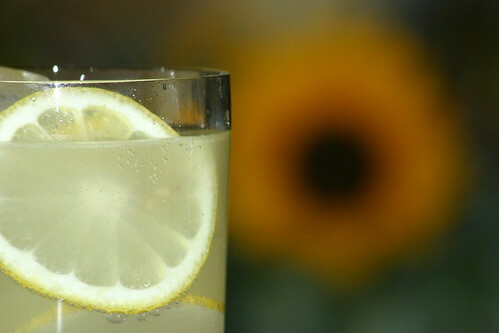 Cocktail Hacker is Foodista’s Featured Drink Blog of the Day today! :) Cruise on over to the site and check out some of the other great food & drink blogs and features. Very cool site.